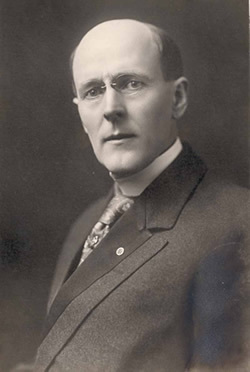 Our 1.2 million-member organization started with the vision of one man, Paul P. Harris. The Chicago attorney formed one of the world’s first service organizations, the Rotary Club of Chicago, on 23rd February 1905, as a place where professionals with diverse backgrounds could exchange ideas and form meaningful, lifelong friendships. He hoped to somehow recapture in a professional club the same friendly spirit he had felt in the small towns of his youth. Rotary’s name came from the group’s early practice of rotating their meetings among the offices of each member. Rotary's popularity spread throughout the United States and in the decade that followed clubs were chartered from San Francisco to New York. By 1921, Rotary clubs had been formed on six continents, and the organization adopted the name Rotary International a year later. As Rotary grew, its mission expanded beyond serving the professional and social interests of club members. Rotarians began pooling their resources and contributing their talents to help serve communities in need. The organization's dedication to this ideal is best expressed in its principal motto: Service Above Self. During WWII, Rotary clubs in Germany, Austria, Italy, Spain, and Japan were forced to disband. Despite the risks, many continued to meet informally and following the war’s end, Rotary members joined together to rebuild their clubs and their countries. In 1945, 49 Rotary members served in 29 delegations to the United Nations Charter Conference. As it approached the dawn of the 21st century, Rotary worked to meet the changing needs of society, expanding its service effort to address such pressing issues as environmental degradation, illiteracy, world hunger, and children at risk. The organization admitted women for the first time (worldwide) in 1989 and has more than 145,000 women members today. Following the collapse of the Berlin Wall and the dissolution of the Soviet Union, Rotary clubs were formed or re-established throughout Central and Eastern Europe. Amwell Rotary Club have worked closely with Rotary Colleagues in Cluj-Napoca, Romania on projects to enhance the facilities at two special schools for deaf children as well as at a Vocational Training School. 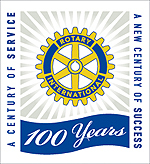 Rotary International celebrated it's Centenary on February 23rd 2005 and various projects, large and small, were undertaken to mark this momentous occasion. Amwell Rotary Club set in place a programme of youth bursaries that are still awarded each year. Through these we have supported several young people as they seek to achieve their full potential in music, in sports and athletics and in drama. After our first "Century of Service", we are concentrating on our next "Century of Success." Our commitment to service is ongoing. We began our fight against polio in 1979 with a project to immunize 6 million children in the Philippines. In 1985, Rotary made a historic commitment to immunize all of the world's children against polio. Working in partnership with non-governmental organizations and national governments through its Polio Plus program, Rotary is the largest private-sector contributor to the global polio eradication campaign. 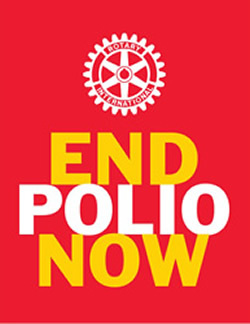 Rotarians have mobilized hundreds of thousands of Polio Plus volunteers and have immunized more than one billion children worldwide. By 2005 Rotary had contributed half a billion dollars to the cause. By 2018, only three countries remain polio-endemic, Afghanistan, Pakistan and Nigeria - down from 125 in 1988.